John M. Browning didn’t get the design of his automatic pistol right on the first few attempts but when he did perfect it he created the automatic pistol that would be the model for a plethora of handguns that would use very similar designs. It had not been Browning’s idea to build a pistol around a .45 caliber cartridge. Back around the turn of the century people were generally impressed with the then very new nitro based smokeless powders and the velocities that could be obtained by them. Thus it was that both John M. Browning and European pistol designers created pistols based on quite small bore cartridges such as the 7.65 Luger and 9mm Parabellum. The United States would very likely have gone the way of Browning’s original cartridge, the .38 Automatic, had it not been for the practical field experience the US Army had been gaining during the Philippine-American war of 1899-1902. Practical field experience drew attention to the shortcomings of .38 caliber cartridges and caused the US Army to give John M. Browning instructions to create a .45 caliber automatic pistol which he duly did. In his design of 1911 John M. Browning took the advice of US Army personnel who had tested his previous models and advised improvements. This pistol is an example of a 1914 manufactured pistol with “S” and “P” marked barrel. The pistol that resulted from that collaboration between serving US Army officers with field experience and John M. Browning resulted in the Model of 1911 and the creation of the .45ACP cartridge that it was designed for. The earliest examples of this design are those that were made at the very beginning of production and the pistol in our pictures is one of those being made in 1914 just as Europe was entering into the Great War. The M1911 pistol was to be given a baptism of fire in that conflict and it was not found to be wanting. 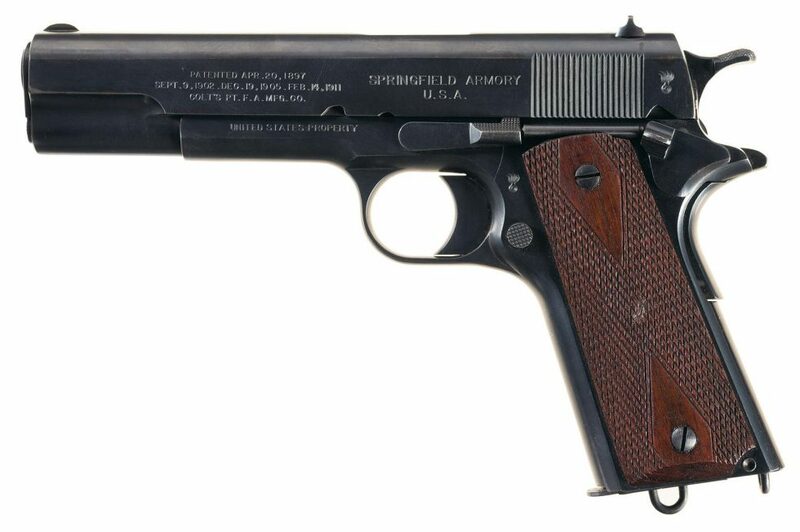 The M1911 was both the standard side arm for US military personnel during the First World War and was also manufactured in the British .455 Automatic caliber and used by British and Commonwealth combatants also. 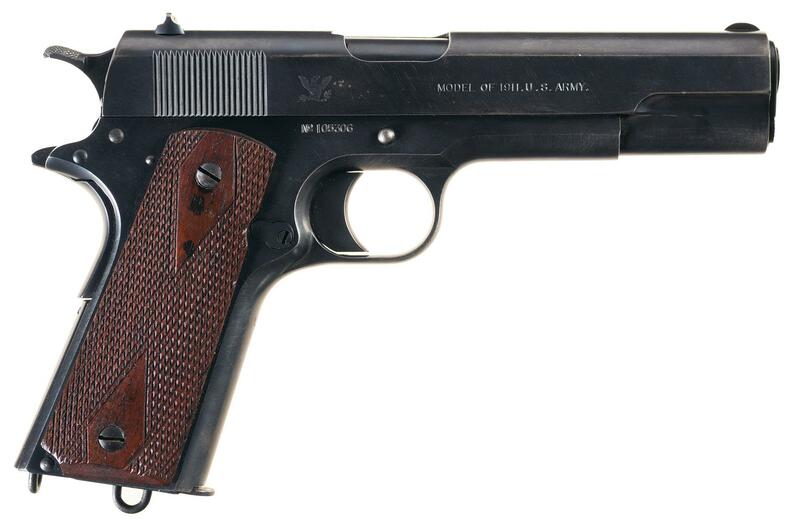 Original 1914 manufactured M1911 pistol for sale by Rock Island Auction. Original early production M1911’s don’t turn up for sale all that often but when they do they command decent prices. The pistol in our photographs is one of these early production pistols having been made in 1914. It looks to be in excellent condition and is listed as having been professionally re-finished. This M1911 is coming up for sale by Rock Island Auction on June 22, 2017. The condition of this handgun is described by Rock Island Auction as follows: “B – EXCELLENT: all original parts; over 80% original finish; sharp lettering, numerals and design on metal; unmarred wood.